WE have the word "Litany" from the Greek, and "Rogation" from the Latin, but both words mean the same thing — a service of supplication, though the latter word is now restricted to the processions or other forms of supplication on the three Rogation Days before Ascension Day. Litanies existed in the 4th century, or earlier, petitions, that is to say, followed by the Greek words, Kyrie eleison ("Lord have mercy"), and afterwards by other responses also. Before it came to be used as a separate service, this type of Litany was already in the Byzantine rite a prominent part of the Holy Communion Service: it still is so, and indeed what strikes the traveller most about the celebration of the Liturgy in Greece or Russia is the deep-voiced deacon, chanting the litanies on the foot-pace in front of the altar-screen, while the choir and people respond. These litanies are comparatively short, as can be seen by Everyman in two metrical translations, nos. 650 and 652 of the English Hymnal. In the West there was anciently a litany sung in procession to the church, a remnant of which is left in the nine-fold Kyrie ("Lord have mercy, Christ have mercy, Lord have mercy," each repeated thrice at the beginning of Mass), from which come our Kyries in the Decalogue ("Lord have mercy upon us, and incline our hearts to keep this law"). There was also a processional service, outside the Liturgy, and associated especially with penitence or particular emergencies. It was in fact what our outdoor Rogation processions still are. 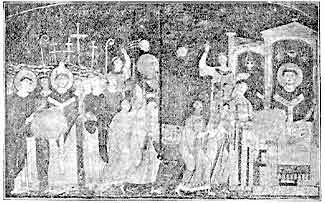 St. Chrysostom introduced processions with responsorial singing through the streets of Constantinople in 398 as an antidote to the out-door services and processions of the Arians, who were excluded from the churches. These processions, which were very magnificent, with their silver crosses and wax-lights, had some free fights with the Arian processions (after the fashion still surviving in Liverpool and Ulster), and were so popular that they remained as a permanent institution. Thus litanies came to be established for times of plague, famine, earthquake, and other occasions of need. They soon reached the West, and in 477 Mamertus, Archbishop of Vienne in Gaul, ordered litanies to be sung on the three days before Ascension Day, because there had been a disastrous earthquake. From Vienne the custom spread over Gaul. There were also about the end of this century processions through Rome to supplant the old annual Pagan procession of prayer for the fruits of the earth on April 25th. Thus began the Rogation Procession, the parent of our English processional Litany. 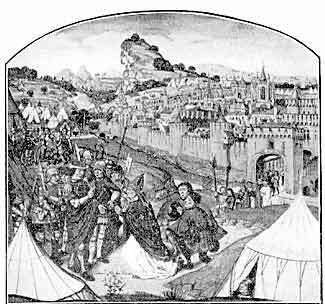 A PROCESSION IN TIME OF WAR, 15TH CENTURY. This processional type of Litany consisted mainly of Antiphons. As the other type, the stationary dialogue of prayer, faded out of the Western Liturgies, its features were added to the processional type; and thus we have the mediaeval Litany, a long dialogue of prayer, sung generally in procession. So the Prayer Book Litany was at first often called "the Procession," whence we find the curious expression "singing the Procession upon their knees." There was in old England a procession round the church to the high altar, before Mass, on Sundays and Holy-days; there were also processions of this kind at dedications, and after Evensong to the rood, or to the font, or to the altar of a saint ; and in Lent a stationary litany was said every day, all kneeling, after Terce. Meanwhile the emergency use of processions continued. It was natural that in times of need the service of supplication should pass outside the church, and that the clerks should wend their way through the streets which were threatened by war or ravaged by pestilence or famine. On great days other processions would be carried out in much magnificence, the King and Queen with splendid heralds and officers, and mitred bishops, taking their part with the ranks of clergy and people, who proceeded through the lovely gabled streets of a mediaeval city to some old church, grey without and jewelled with colour and lights within; and here a sermon would be preached and Mass said. The ordinary Rogation procession was, however, very simple, and the priest did not, according to the Sarum Processional, wear a cope. In 1544 (as we have said on p. 57) Cranmer produced the English Litany, which was the first instalment of the Prayer Book, and which most people consider to be the finest form of prayer in our language. It combines the principal features common to all the old litanies: part is from the Sarum Litany in time of war (England was at war in that year): another part from the Sarum Litany on Rogation Monday, and another part from a German Litany by Luther. The English Litany was first (in 1544) ordered as a special supplication for Wednesdays and Fridays, in view of the French and Scottish wars; in 1545 by royal injunction it superseded the old Procession before Mass; and in 1549 it was ordered to be used always Wednesdays and Fridays. 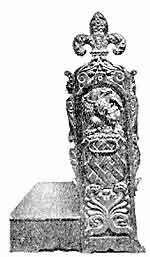 It was equally suitable for stationary and for processional use, and for special or for ordinary occasions thus it was ordered to be said "immediately before the time of communion of the Sacrament," in 1559, when it was also appointed for the "perambulation of the circuits of parishes" on the Rogation Days. The Rogationtide processional use of the Litany is frequently mentioned in the bishops' visitation articles of the 17th century, so that the idea of the double use was well established. We may add a word here about processions in general. They have naturally been always used for utilitarian purposes, as, for instance, when a body was carried to the tomb, or when candidates were brought to the font. They also have a place as special acts of prayer and praise. Until 1549 processions of the latter sort were sung before the Eucharist on festivals, especially the different versions of Salve festa dies (" Hail thee, festival day," the examples in the English Hymnal being nos. 624, 628, 630, 634); the First Prayer Book has a rubric allowing for some such substitution, and Cranmer had made some experimental translations of festival processions, but was dissatisfied with his skill in verse (p. 130). Thus in the Prayer Book the only processions specifically ordered besides the Litany are that to the font for Baptism after the Second Lesson (for which no words are provided), that to the holy Table at Weddings (for which two psalms are provided), and the two connected with the Burial of the Dead, for the first of which Sentences are given. In the 19th century the Hymn Books supplied the want, and processions (largely regarded at first as a cheerful way of entering church, and devoid of stations for prayer) became very popular on festivals. 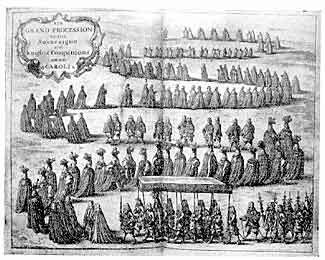 Other processions, however, were in use before the modern popular revival, as those for Rogationtide, mentioned above, for instance, or that shown on p. 170 [immediately below]; and at the coronation of a sovereign there is a procession of special magnificence in Westminster Abbey. Within the last twenty years the use of the Litany in procession on ordinary Sundays has been revived, and has spread steadily. Churchmen, however, were still very shy about proceeding out of doors, and did very little in this direction till the Salvation Army and the Church Army had familiarized the whole Empire with the idea. Now, Rogation and other out-door perambulations are increasing each year, and in 1911 a conspicuous new departure was made by the Bishop of London's Evangelistic Council, which organized an enormous procession down the Strand. PROCESSION OF THE KNIGHTS OF THE GARTER, WITH CLERGY AND CHORISTERS. We can explain the origin and structure of the Litany in tabular form, first reminding the reader that the Mediaeval litanies (as far back as Anglo-Saxon times) contained many invocations of the Saints after the opening invocation of the Holy Trinity, each having the refrain "Ora pro nobis." Cranmer, in 1544, reduced these invocations to three — (1) Saint Mary, (2) the Angels, and (3) "All holy patriarchs, and prophets, apostles, martyrs, confessors, and virgins, and all the blessed company of heaven, Pray for us." These were omitted in 1549 from the First Prayer Book. O God the Father," . . . concluding with the petition Remember not Lord. . .
Sarum Antiphon to Penitential Psalms. From all evil . . . to . . . Word and Commandment. (entreaties that we may be delivered by the power of Christ). By the mystery . . . to . . . day of judgement. Various ancient sources Sarum Processional (Litany for Rogation Monday), — with some parts (especially the Intercessions after unity, peace, and concord) from a mediaeval litany revised by Luther. We sinners do beseech . . . to . . . turn their hearts. That it may please . . . kindly fruits of the earth . . . to . . . according to thy holy Word. III. THE KYRIE AND THE LORD'S PRAYER. Son of God . . . to . . . O Christ, hear us. Lord, have mercy upon us . . . Concluding V. R. and Collect. Priest. O Lord, deal not . . .
Let us pray. O God, merciful Father . . .
As it was in the beginning . . . Sarum Mass for those in trouble of heart: also in Luther's Litany. From our enemies . . . to . . . graciously hear us, 0 Lord Christ. Concluding V. R. and Prayers. Sarum Litany in time of war. Priest. O Lord, let thy mercy . . .
Sarum Breviary, Lands, Prime, and Compline. Let us pray. We humbly beseech . . .
From the Liturgy of St. Chrysostom. 2 Cor. xiii and Liturgy of St. Chrysostom. The Prayer of St. Chrysostom is taken from the Eastern Liturgy of St. Chrysostom, where it is said (as in that of St. Basil) by the priest during the deacon's litany in the first part of the Liturgy. It was translated by Cranmer for the English Litany, being thus by him intended to be used in its original Eucharistic connection and it therefore belongs properly to the Litany, and not to the Divine Service. It was not till the last Revision in 1662 that it was placed at the end of Mattins and Evensong, a mistaken proceeding which suggests a certain poverty of invention. Thus the Prayer Book Litany, while it combines the two original objects of processions — prayer against evils and dangers, and prayer for the fruits of the earth — greatly extends the realm of intercession, stretching out those touching and melodious phrases, which are now of the very marrow of the English language, to all human needs, dangers, sorrows, aspirations, and efforts towards perfection, and ending with the two beautiful supplications in which the people turn at length to pray for their own necessities. In contrast to the weak and selfish spirit of many popular modern devotions, we think proudly of the English Litany, and have a right to be proud of it; for we can turn to the whole world, Christian and otherwise, and say, "This is how we pray, this is how we are taught to think of life and death, of God and man ; and this is a service we really use, a popular service, known and loved and understood by all." We are indeed brought to the mysteries of the Eucharist through a noble gate, through the preparation of that generous, unselfish, and humble intercession for the human race which the Litany has given us ; and it is our own fault if our religion falls behind the fullness of the Gospel of Christ.